I decided to write a tutorial today for another Ubuntu 14.04 Server based HTPC and media server setup guide. I’ve read a forum thread where the original poster is asking if there is some way to setup an HTPC File Server Combo on his machine. Some of the respondents answered by suggesting to setup a Samba server or NFS connection, but the post author isn’t skillful enough to setup the thing on his own. So I decided to wrtie this guide on how you would exactly do this, the easy way, using a FREE-AND-OPEN-SOURCE-SOFTWARE (FOSS) called Owncloud. I’ll share this guide later on the forum site. So with Owncloud, XBMC (KODI in next release) plus Ubuntu Server 14.04 LTS, we could put up a configuration that will serve as an HTPC, DLNA server, streaming media server, file server, that has a file sync feature like the one offered by Dropbox or Google Drive. But what the heck is Owncloud anyway? 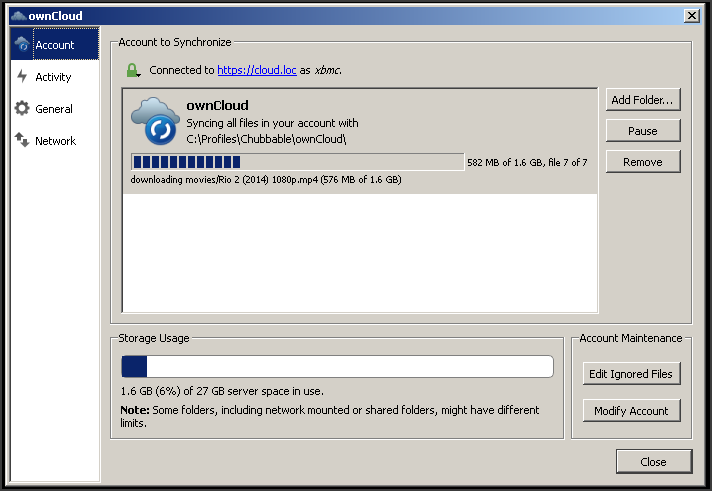 Stylized as ownCloud, it is generally free and OpenSource software that functions like a Dropbox (for the file Sync part). Almost all of us know that Dropbox is a free cloud-based file hosting service with file synchronization feature. It’s a free (up to 2GB) personal cloud storage service. It’s very similar with Owncloud, the difference is, you have to provide your own hardware/infrastructure where you could install Owncloud and configure it as your privately-owned cloud server or cloud storage, and file server solution. You could install and use Owncloud within your own internal network, as well as, to a cloud VPS (Virtual Private Server) like the ones offered by Amazon AWS and DigitalOcean. Owncloud, like any other software, you need to install and configure it afterwards to match your intended mode of operation. Like Dropbox, Owncloud has a client connection software that automatically syncs your local file/folder to your private cloud folder. It also has a WebDAV feature that you could connect to, from various clients (Smartphones and Desktops) by just accessing your webdav server address. Connecting to your account using webdav is simple and easy, just take note of your user account and your webdav address. The main purpose of this guide, is to setup an Linux-based media server, a file server, a DLNA server, a streaming media server, and at the same time an HTPC, all under one machine. This build is going to be a power-saving machine that you could power-on 24 hours a day, seven days a week. You also call this as a multi-in-one htpc media server. Linux-based media server guide on how to install XBMC and Plex. Since this tutorial involves Owncloud manual installation on a Linux-based machine (Ubuntu Server 14.04 LTS), it requires command-line typing using Linux terminal or Windows putty.exe. Don’t be discourage by this because I will make it very easy for you. You may copy-and-paste most of the commands and you just need to substitute the values applicable to your installation. Note: You need putty.exe if you’re on Windows. Admin user-name & user-password for Owncloud => admin/admin These are the values I’ve used in this guide. You should use your own values. Step 1: Connect to your HTPC remotely via SSH. You could actually install Owncloud directly from your XBMC or HTPC machine, but the advantage of using SSH is that, you could easily copy and paste codes in your command-line and you don’t have to manually type in the long syntaxes for the installation. To connect to your target machine using SSH, open up putty.exe or a terminal in Linux (ctrl + t), then type in ssh chubbable@192.168.1.252. chubbable is my user-name on my HTPC machine with a static IP address of 192.168.1.252 If it’s your first time to connect, you’ll be greeted with a message The authenticity of the blah... blah..., make sure that you’re connecting to your target machine, type yes and press enter to continue. You should be now logged-in remotely to your HTPC machine. Step 2: Download the latest version of ownCloud. Step 3: Install Apache2 web server and other dependency packages. Since ownCloud is a web-based application, it needs to have a web server to run on. Just like any other web-script (ie. WordPress), it requires a web host to be installed on. So for this step, we need to install Owncloud’s dependency packages and at the same time install Apache 2 web server, MySQL Database server and PHP (plus important modules). You could just copy and paste the codes used in this step. You just have to substitute the values that are most applicable to your case. To continue with this step, copy the following code and paste it in your command-line, then press ENTER key. Input your user-password when asked. It’ll take around 10 minutes for this to finish. It depends on your Internet and system-drive’s speed. During the installation process, a new screen should pop up similar to the image shown below. 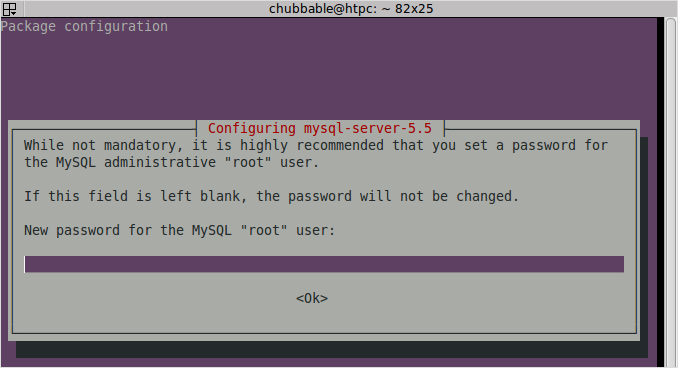 Nominate a password for the MySQL Database root user account. So input your password, then hit ENTER key. You’ll be asked to enter it twice for confirmation and double-checking. Installation should continue. Now, you’re ready for the next step. Step 5: Copy the owncloud folder or better yet move it to your virtualhost’s document root by typing the following command. You should see the folders owncloud, ssl and logs. Did you see them? Cool! Now continue with the next step. Note: You may change cloud.loc to anything you want. Add your domain name to your client machine’s hosts file. If you’re on Linux, you could do this by typing this in your commandline: sudo nano /etc/hosts Then write a new line of text and add the IP address of your XBMC or HTPC machine and then your domain name. ctrl + o -> Enter -> ctrl + x. To do this in windows XP/7/8, navigate to system-folder\system32\drivers\etc\ and edit the file hosts. 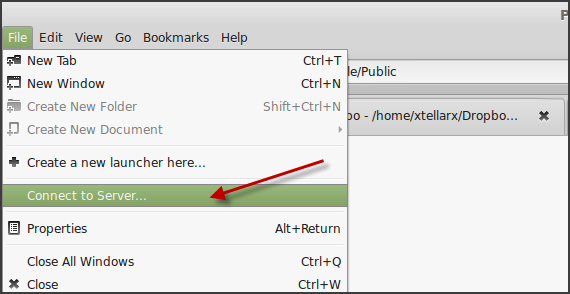 It’s a hidden file, so you need first to enable Show hidden files option in Windows EXplorer. Step 7: Create a Self-signed SSL Certificate For your ownCloud instance. You need a self-signed certificate to be used with your SSL virtualhost in Apache. Creating this certificate is simple, you may just copy and paste the commands below. 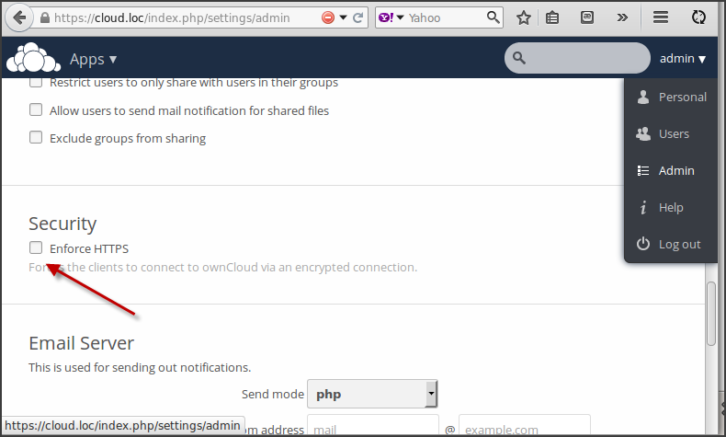 This step should enable https connection in ownCloud. You should see owncloud-ssl.crt and owncloud-ssl.key file. Now you might wanna ask your self, how to use SSL in ownCloud? The answer can be found in the next step below. Step 8: Create an SSL VirtualHost. This is the part where you will use the SSL files you’ve generated from the previous step above. After successfully creating the certificate files, you now need to create the SSL virtual host for your domain. To do this, copy the file default-ssl.conf from /etc/apache2/sites-available/default-ssl.conf and paste it to a new file called ssl-cloud.loc.conf. To do that, type the following and press Enter key. Save the file, and enable the SSL virtualhost. If there is no error upon Apache restarts, then you’ve successfully enabled your SSL VirtualHost. Step 9: Create a Virtualhost for your ownCloud instance. This virtual host will host your domain for your Owncloud instance. In my case, I named my domain like so, cloud.loc. For this step, you need to create a new virtualhost and set the document root to be used by Owncloud. To do this, create a new .conf file for your Owncloud virtualhost. It’s better to use a file name that reflects your domain name. In my case my local domain name is cloud.loc, so I would name my .conf file like so, cloud.loc.conf. Step 10: Enable Apache Mods for ownCloud. Step 11: Check your ownCloud domain and see if it’ll connect via HTTPS connection. 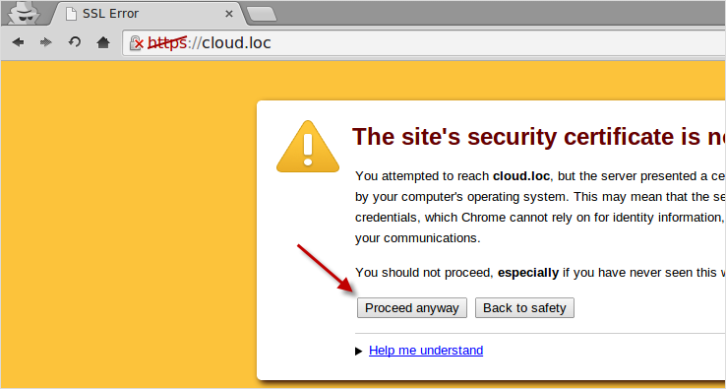 Access your ownCloud domain using https://cloud.loc If you see a splash page saying This Connection Is Untrusted using Firefox, then that’s a good indication that you’ve configured SSL in ownCloud correctly. To continue, click I Understand the Risk and then Add Exception -> Confirm Security Exception. You should be then redirected to the Admin Web-GUI. You just need to click Proceed Anyway button to continue logging in. Step 12: Create a new database for ownCloud installation. First login as root to MySQL server via commandline. Type-in the below code and hit ENTER key. You’ll be prompted to enter your MySQL root password (the you entered during Step 3), enter it and press enter key. Create the new database by typing the following command and press ENTER key. Create new user and grant privileges to the new database. Then reload user privileges to set the privileges for the user. Done! Exit the prompt by typing exit + enter key. Switch to your browser and access your domain name. Then proceed to the next step. Note: owncloud and admin are for illustration purpose only. Use your own values. 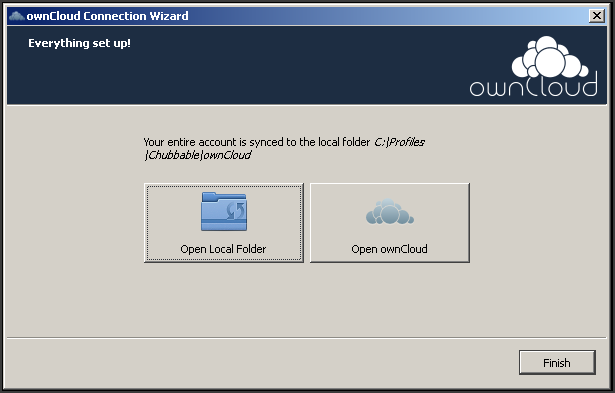 Step 13: Install ownCloud by initiating the installation wizard. Browse to cloud.loc and fill up the necessary fields on that page. After filling the necessary fields, click Finish setup button and you should be taken to the ownCloud admin page. If you reached the page similar to the image shown above, then you’ve successfully installed ownCloud on Ubuntu Server 14.04 LTS. To configure it as a file server with XBMC/HTPC, follow the post-install guide and configure ownCloud from it’s Web-GUI. The next task that you need to do is to enforce https connection to your ownCloud server. This settings will always redirect a user to the secure side of your server. So how to always enable HTTPS in ownCloud? To enable HTTPS connection to your ownCloud-based file server, you need to login in again using the https protocol. So if you’re logged in right now, logout first and then login again using https://cloud.loc. Then navigate to main admin menu from the top-right corner of the page, then hover your mouse to Admin and click it, scroll down a little further till you see the Enforce HTTPS check-box. Tick the box and you’re done. this page. You may choose and download the client software for either desktop clients or mobile devices. After downloading the client app, install and run it from your device. Installing it is fairly easy, especially on Windows and Mac. 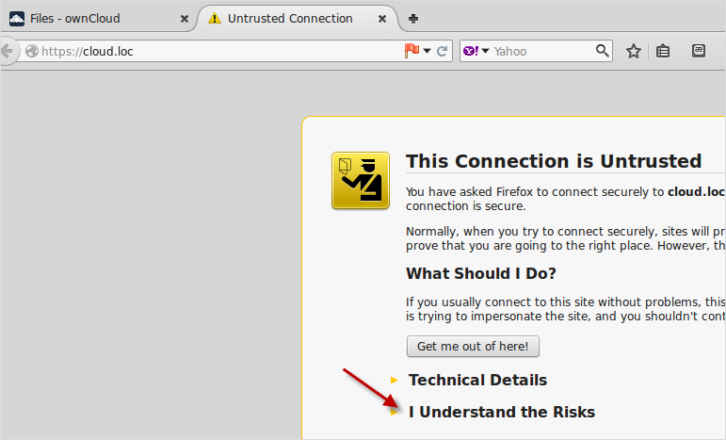 Then click next, a new window should pop-up warning you about SSL connection, double check the certificate and tick Trust this certificate and finally click ok.
You should be then taken to the login windows. Now fill up the user-name and password field and click next. The next dialog will let you choose your local folder, you may choose another folder or just accept the default folder path, which is profile-name\owncloud. 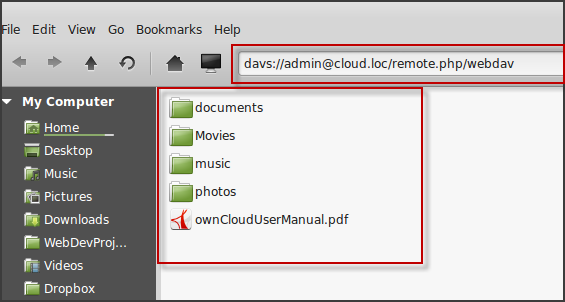 ownCloud should be running now already and minimized in your system tray like Dropbox does. Now you’re ready to make the sync. Connecting from Mac or Linux is very similar, so you may just use this Windows guide as a reference. After a successful installation, you got really excited and you wanted to test the server straight away. So you might ask, how to connect to ownCloud? Connecting to ownCloud is fairly easy, you just need to get your WebDAV server address. In this case, my server address is https://cloud.loc/remote.php/webdav/. You could use an IP address instead of a domain name. Connecting from Mac is fairly easy too and very similar. Just open up your explorer then go to main menu -> Go -> Connect to Server. How to connect from XBMC? To connect to ownCloud using XBMC, go to Video -> File -> Files -> Add Videos. Then click Browse -> Add Network Location. With the power of Open Source projects, you can accomplish many things on top of ordinary. As you have witnessed in this guide, we’ve installed a web-server plus ownCloud in addition to your existing XBMC-based HTPC and Plex media server. This is made possible by our Host-OS, which is Ubuntu 14.04 LTS server. 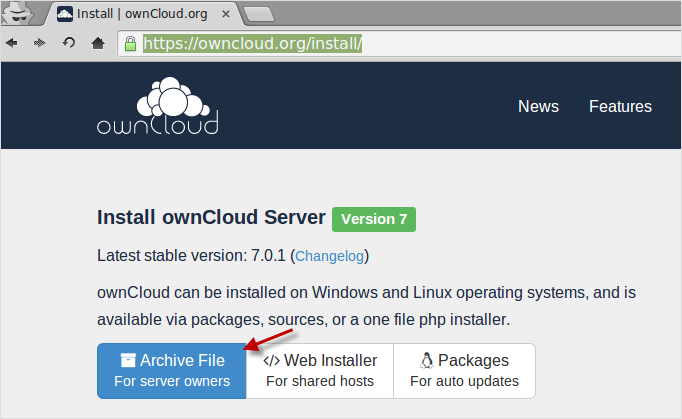 In this guide, you’ve learned how to install owncloud in Ubuntu 14.04, and also, you’ve build yourself an HTPC-File-Server combo from scratch using free downloadable software. So if you’ve completed this guide successfully, pat yourself on the back. For those who need further help or anyone who wants to improve this post, feel free to make a comment below. Thank you all for taking your time in reading this setup guide. This entry was posted in Howtos and tagged howto, ubuntu server.